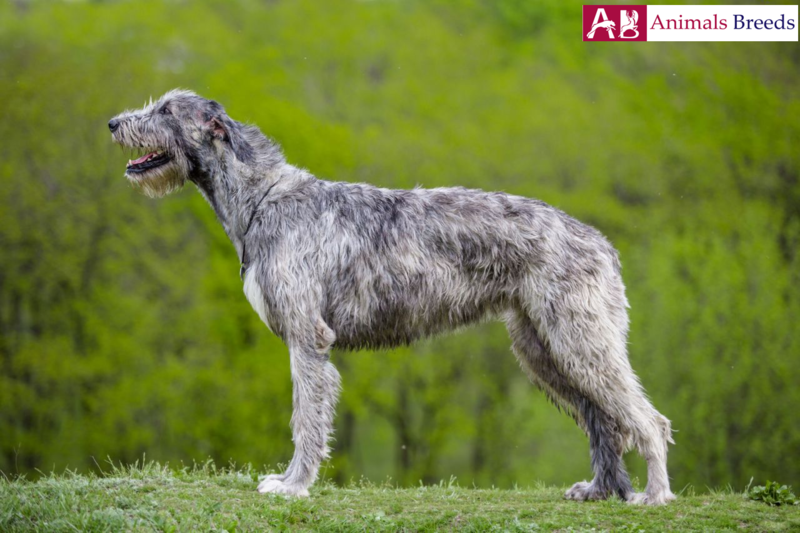 Irish wolfhound is the tallest dog breed and has the sweetest behavior of all the other canine animals. These dogs mature slowly so provide it quality diet so that it can achieve optimum growth of its body. Till the time, they don’t get mature fully; do not take them out for hunting or conducting vigorous exercise. This mammoth animal can be intimidating to look but they are not reliable for guard dog duty. They are so sweet and amiable that they greet strangers as if they are his old, long friend. Irish wolfhound is bestowed with power, swiftness and eagle-sight. This breed thrives well in a countryside where he gets enough space to wander and run. Puppies tend to be rambunctious in nature than adult dogs. You might think that their formidable size can be threatening to small children but they are patient and won’t mind children who want to climb over them. With older children they enjoy playing and fetch games. The phrase “gentle giant” describes the dog well. The only heartbreaking thing about this dog is that they are short-lived. Many speculations have been made about this breed. 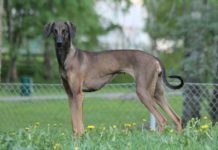 It is believed that British sea traders brought the Middle Eastern sighthound to Ireland. These dogs cross mated with native mastiffs to produce giant wolfhound. Few experts hold the opinion that the dog has Irish Sheepdog and Scottish deerhound in its ancestry. This breed became precious possession for the people of that time because of its remarkable hunting skills in killing large animals like boar, deer and particularly wolf. Modern day Irish wolfhound is used for companionship rather than hunting because of its sweet and friendly disposition. They are one of the costliest breed. Average price of the puppy is $1,500 to $2,000. The dog is massive, muscular and has a commanding appearance. It has elongated face and skull is not too broad. Muzzle of the dog is also long and not so pointed. The ears are small and carried backward. Neck is well arched, long and strong. Tail of the dog is long and gets curved towards the end. The dog has eyebrows and beard which gives it wise appearance. The average height of the dog should be more than Great Dane. Male breed should be 32 inches tall at the withers and should weigh around 120 pounds. Female breed should be 30 inches tall and weight should be 105 pounds. The dog has a rough, shaggy and wiry coat. Grey is the most common color. Other colors include brindle, red, black, white and fawn. Personality – The dog has a great size, unique appearance and is gifted with power and swiftness. Being a sighthound, it has eagle like piercing and vivid eyes. All these qualities make it perfect for hunting large animals. The dog is loyal, friendly and wants to be included in all aspects of human life. It is not an outdoor breed as it craves to live with its family. They are patient with children and polite with strangers. Behavior – The dog has an athletic look but they wouldn’t mind being a couch potato. They love afternoon naps. Apart from using the dog to hunt wolf, they were also used to watch over sleeping armies. The dog fulfills its responsibility with determination. Hunting instincts in the dog is still intact. Animal aggression is common with all sight hounds. It might get furious over the dog he doesn’t know. Inside home it remains like a good mannered animal showing no signs of nuisance and hyperactivity. They are not frequent barkers but will bark to let you know of the approaching stranger. Activities requirement – The dog loves to relax under the shade rather than running in the field. It is important to motivate the dog for physical exercise so that it can burn its extra calorie. However once they have been cheered up for exercise, they become active to play and walk around the park. Training – Experienced trainer will find no difficulty to train this dog. Be consistent in training and use positive techniques only. Socialization lesson is important to have an outgoing and tolerable dog. Do not resort to physically correcting them while training. The dog requires quality nutrition throughout its life. Puppy tends to be energetic and active so feed bones and proteins that could foster their development. An adult dog should be fed twice a day. Do not feed this breed high energy food which that could be fatal for their bones and joints. The dog can live up to 6 to 8 years. It is not hypoallergenic breed. Like many large dogs, they are also prone to get affected by dilated cardiomyopathy and bone cancer which is the most common reason for early death of this breed. Other issues include- bottleneck, Porto systemic shunt, bloat, thyroid etc. The dog sheds averagely. Weekly combing is enough to maintain its coat. You can hand-strip its coat or use stripping knife. It is recommended to leave its facial hair because that’s what gives it unique look. Bathe the dog as necessary. Brushing its teeth, trimming its nails and cleaning its ears should be a part of grooming regime. Despite being gentle giant, they are not suitable for apartment living because they tend to be clumsy and uncomfortable inside home. The dog is proficient in killing large animals. They are not suitable for apartment living.